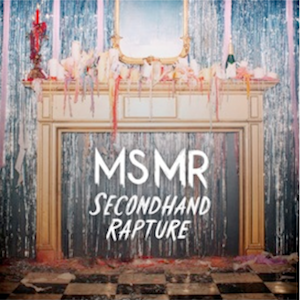 MS MR only began in 2011, yet vocalist Lizzy Plapinger and producer Max Hershenow have already secured a record deal with Columbia Records, with who they’re about to drop their debut album Secondhand Rapture. While their finger-pointing is not nearly as poetically snide as say Alanis Morissette, their bitterness is intriguingly inviting – asking the listener to relate and shout out at that universal rogue who broke their heart. The duo met while attending Vassar College in upstate New York, and began collaborating soon after graduation. Several singles and music videos have been released already, as well as an EP titled Candy Bar Creep Show. The music videos were released via Tumblr, which they said matched their vision for the band’s visual aesthetic. For their music video “Hurricane” their visual aesthetic is apparently a smorgasbord of cult classic films, ’90s grunge, and Godzilla spouting fire – it’s what you get if you scroll down Tumblr really, really fast. Secondhand Rapture billows with lush, gutsy bellowing that falls into delicate moments of minimalism. It hinges on that constant freefall of vertigo and the uncontrollable, while juxtaposed with tightly produced beats from Hershenow. “No Trace” is a sneering anthem of liberty lost and found again, complete with arpeggio swells and vocals that emanate from deeper than the diaphragm. Currently on tour, they’ll be hitting up New York’s Bowery Ballroom next on the 15th – if you’re in the area, then grab some tickets and belt out those woes.